Our posters are printed in full colour on one side on eco-friendly paper from sustainable sources. Our prices include FREE delivery within 5 working days to one UK address excluding Highland and Islands and there is no charge for debit or credit cards. For deliveries to Highland and Islands please call for a price that includes delivery to these locations. 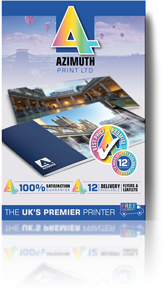 If you need your poster printing sooner, contact us to discuss a quicker delivery time. 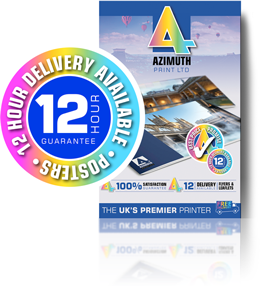 We also have a 12-hour A3 poster printing service for just that purpose. What can printed posters books do for me? Putting up posters is still one of the most effective ways of informing a customer base about an upcoming event or new product, despite the rise of the internet and social media websites such as Facebook or Twitter. They provide an ideal method of getting your company's name known among the public and an eye-catching design can be a cheap and easy way of boosting sales or raising awareness of an event. A well-designed, generously-sized poster placed in a shop window, on a notice board or inside a club or restaurant will stick in the mind of those who see it, encouraging them to act on the message it is promoting. They can be beneficial for a whole host of different bodies or organisations, such as a small business opening a new store, a band announcing its latest tour or restaurants promoting a new menu. 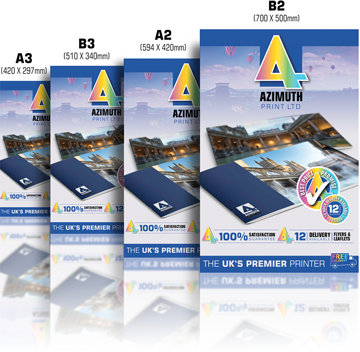 Azimuth Print, the UK's premier poster printer offers a cheap, high-quality poster printing service. We can produce posters in sizes ranging from A3 (420 x 297 mm), all the way up to 1,100 x 4,000 mm, with A3 posters available in runs as small as ten and large-scale posters offered individually. 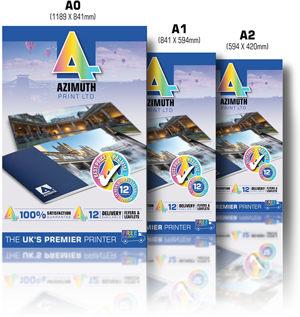 All the items are printed on high-quality paper and are produced in full-colour, giving an accurate representation of the image or design provided by you. We provide a free online poster design service. If you do not have print ready artwork and you would like to create your own poster design, try our Online Design Studio. You can create your artwork from scratch or you can select one of more than a thousand free poster templates. Our Online Design Studio is easy to use and it is FREE! You can either send us your own artwork or commission our designers to come up with a great look for your printed posters for an extra charge. If you need to make small changes to your copy and design, we can take care of these at no extra cost, while larger amendments to your poster can also be made for a fee. To find out more about the UK's premier poster printer, just get in touch for a quote or for answers to any questions you might have about our poster printing services.